Childred go through a lot of changes in their first ten years of life, learning to feed themselves, walk, use language, and use the toilet. If you think that's dramatic, just wait for the next ten years. 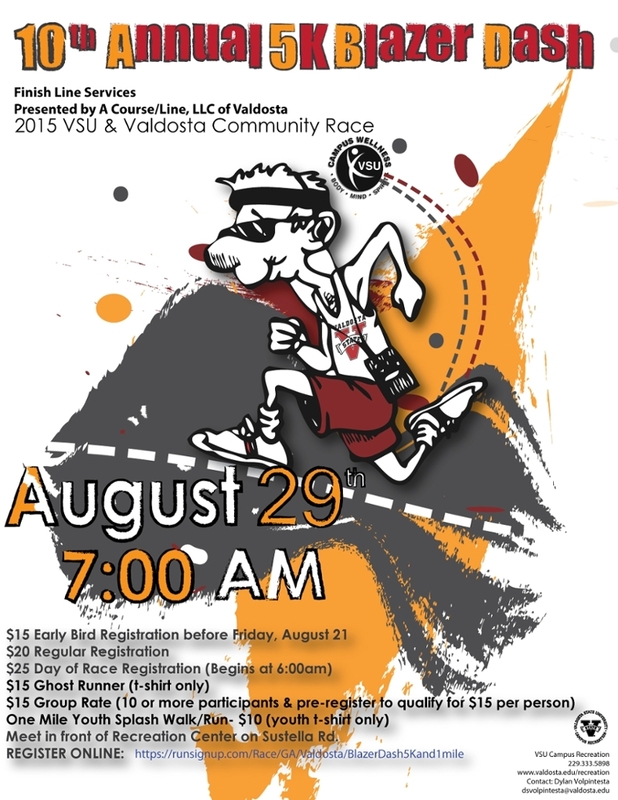 Valdosta State University's Blazer Dash 5K has also had its share of changes in the last five years--different names, different runners, different courses. But it's still a 3.1-mile race on the school's Valdosta, Georgia, campus. 123 athletes showed up to finish the tenth running of the race on Saturday morning, 29 August 2015. The fastest was Greg George, who scooted over the finish line in 18:22, some 40 meters ahead of runner-up Dan Butzin. Butzin's time was 18:32. Former Lakeside High cross country runner Max Steele was third in 18:51. Pine Grove middle school eighth-grader Carson Locke was fourth in 20:16 and Valdosta's Matthew White was fifth in 20:19. Valdosta runner Randy Maples was the top master runner in the Blazer Dash, placing sixth overall in 21:21. The men's race may have been close, but the women's was closer. Anne Price narrowly outkicked Alice Smoot for the women's title, 22:04 to 22:05. 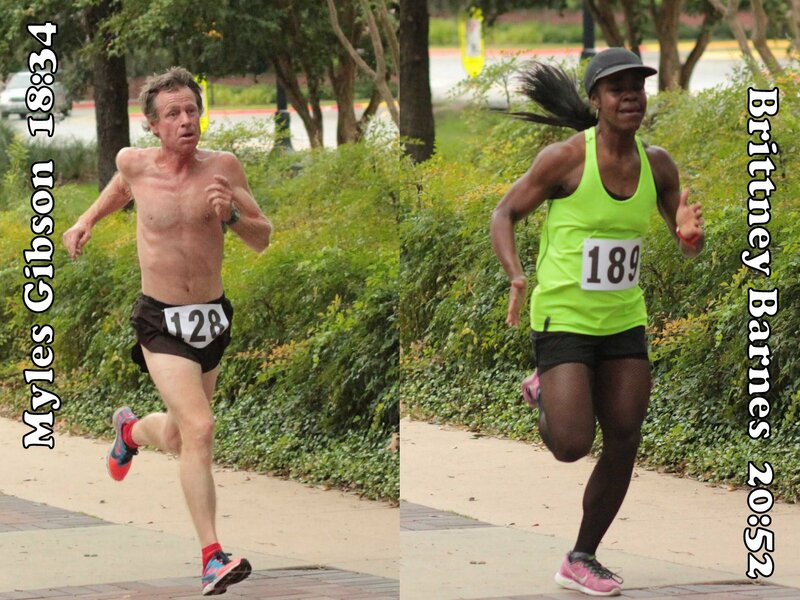 The two Valdosta athlete placed eighth and ninth overall. Smoot, the top female master in the race, had won the Blazer Dash women's title in 2013. Sugar Hill, Georgia, runner Abbi Edwards outkicked Jessica Locke of Valdosta for the third spot in the women's standings, both runners clocked in 24:34. Edwards and Locke were 14th and 15th overall. On Saturday morning, 29 August 2015, Myles Gibson won the Tallahassee Rollergirls' third annual Fishnet 5K, outrunning a field of 111 athletes. The Donalsonville, Georgia, master runner covered the tough 3.1-mile course around Florida State University's Tallahassee campus in 18:34, crossing the Integration Statue finish line almost 400 meters ahead of the next competitor. Tallahassee athlete Brittney Barnes took the women's title, placing third overall in 20:52. Jim Halley clocked 20:07 to finish runner-up to Gibson in the race. Eric Schab was the third male finisher, coming in sixth overall in 23:07. Master runner Mike LaBossiere was fourth in the male standings, finishing seventh overall in 23:17. LaBossiere has run all three Fishnet 5K races. Katie Sack was second in the women's standings, placing fourth overall in 22:23. Lyssa Oberkreser was the top woman master and fifth female finisher, 13th overall in 25:43. 29 August 2015 was the first Saturday of cross country season for Florida's high schools. However, Wakulla High senior cross country runners Evan Guarino and Albert Smythe weren't at a cross country meet that morning. 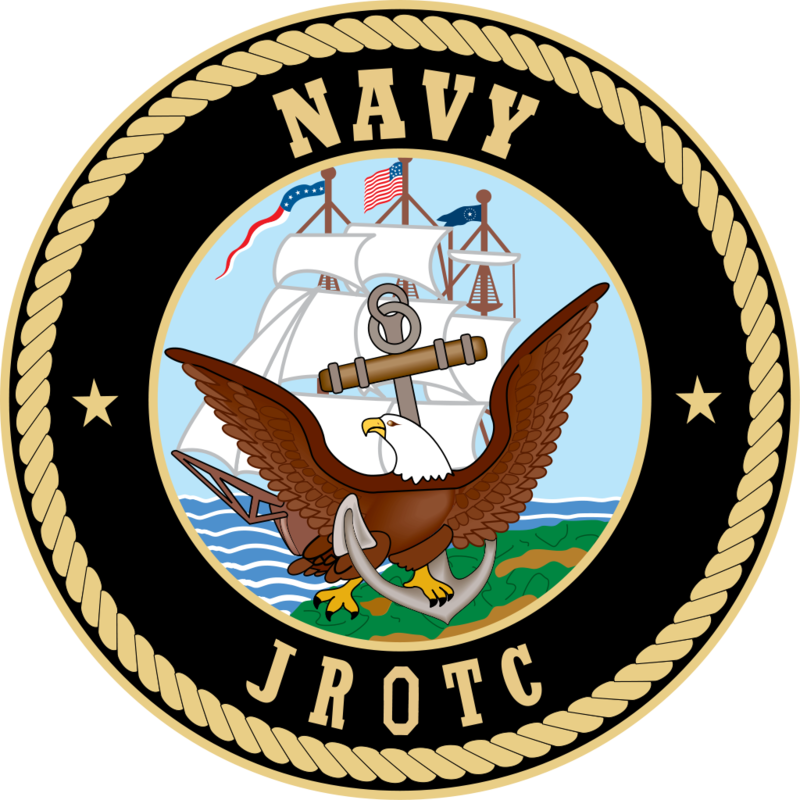 They were at Wakulla Springs State Park for the Wakulla High Navy Junior ROTC 5K, where Guarino won the race in 19:30 with Smythe runner-up a few steps back in 19:32. Aaron Taylor took third in 19:48. Crawfordville, Florida, athlete Duane Evans was the top master in the race, placing fourth overall in 19:56. Master runner Hillary Brigham was the first female finisher in the race, coming in 18th overall in 28:42. Wakulla High junior Alissa Anthony was second in the women's standings, finishing 22nd overall in 31:03. 42 athletes finished the 2015 Wakulla high NJROTC 5K. 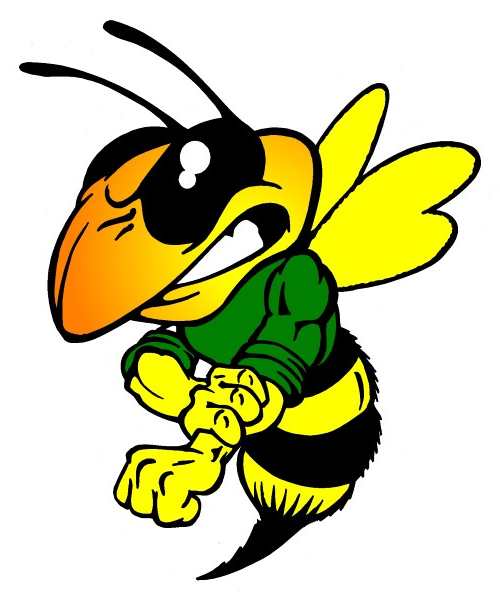 Whatever the GHSA calendar may say, high school cross country in Southwest Georgia doesn't start until the annual Pelham Hornet Cross Country Invitational. This year the region's harriers raced in that opener on Saturday morning, 22 August 2015. The Bainbridge High Bearcats took the boy's title for the third year in a row scoring a nearly-unbeatable 30 points, while Bearcat sophomore Poncherella Leonard won individual honors with a 17:34. On the girls' side Thomas County Central totaled 75 points to reign as the top team. Colquitt County sophomore Elizabeth Funderburk was the winning individual in the girls' 5K, running 21:04. The high school competition at the Invitational opened with the girls' 5K. The race was all Elizabeth Funderburk's; the Colquitt County Packer sophomore's 21:04 put her more than 150 meters ahead of the next athlete. However, Funderburk was the Packer's only runner in the top 20, which didn't bode well for the Colquitt County's chances in the team standings. Meanwhile, the Thomas County Central Yellowjackets not only had sophomore Cara Eaton finish second in 21:48, but also had sophomore Jinglei Horchler crack the top ten with a 24:20 ninth-place finish. The Yellowjackets put four runners in the top fifteen, then sealed victory and a 75-point total with a 41st-place 29:14 showing from junior Logan Covington. Close behind the Yellowjackets, Tift County edged Lee County for second, 81 to 82. Tift County was led by sophomore Ashlee Golden (7th, 23:56), and Lee County by junior Ansley Cain (11th, 24:32). The bad news for everyone in the boys' 5K was that an error by the timing company running the finish line made it impossible to compile complete results for the race. The bad news for everyone but Bainbridge was that you didn't need complete results to tell that the Bearcats had won again. Even worse news for everyone but Bainbridge was that the Bearcats took the top two places in the race with a sophomore and a freshman--Poncharella Leonard (1st, 17:34) and Caleb Harris (2nd, 18:07)--two athletes that runners in the area could be chasing for the next three years. That one-two finish started Bainbridge toward a winning total of 30 points. Behind the third-place 18:43 finish of senior Sam Gelabert, Thomas County Central placed second with 40 points. Tift Middle Schools' eighth-grader Emily Golden was dominating in the middle school girls' two mile, running 13:28 and finishing more than 250 meters ahead of the next runner, Brianna Zupko (2nd, 14:37) of Worth County. Aside from Golden, Tift had three other athletes in the top ten--sixth-graders Caroline Vickers (6th, 15:35) and Ainsley Toews (8th, 15:42), plus seventh-grader Noelia Sandoval (10th, 16:05). Eighth-grader Alexandria Vaughn (11th, 16:15) wasn't far behind, giving her team a total of 32 points and the win. Led by sixth-grader Emily Phillips (3rd, 14:50), Lee County was seocond in the team standings with 85 points, just ahead of the 91 scored by third-place Valdosta. Valdosta eighth-grader won the boys' two mile with a 12:29, just ahead of the 12:39 posted by runner-up Bryce Stephens, a Tift seventh-grader. However, it was the Lee County boys who won the team title. Lee County put sixth-grader Josh Macklin (4th, 12:55), eighth-grader Ben Phillips (5th, 13:03), and eighth-grader Walker Pinson (8th, 13:24) in the top ten. Four more runners Lee County runners made the top twenty, including scorers Will Tomlinson (11th, 13:58) and Robbie Collins (15th, 14:17), both in the seventh grade. It was enough to give Lee County a winning total of 43 points. Valdosta was a distance second with 97 points. Bainbridge squeaked by Thomas County Central for third, 106 to 107, Bainbridge led by eighth-grader Stokes Moore (3rd, 12:49) and Central by eighth-grader Brandon Hopper (14th, 14:10). Whether their season ends with the Georgia State Middle School Cross Country Championships in Cochran on 17 October 2015 or the GHSA State Cross Country Championships in Carrollton on 7 November 2015, all of these athletes have a lot of racing ahead of them this fall. 3rd annual Fishnet 5K. 8:00 AM ET. Florida State University Integration, 104 North Woodward Avenue, Tallahassee, Florida 32313. 2014 story. 2013 story. Event page on Facebook. Online registration at RunSignUp.com. Fabulous Feet 5K. 9:00 AM ET. Georgia Southwestern State University, 800 University Drive, Americus, Georgia 31709. Online registration at active.com. Georgia Southwestern State University chapter of Kappa Delta, 229-403-1084. Vanishing River 4.4-Mile Trail Run. 8:00 AM ET. O'Leno State Park, 410 SE O'Leno Park Road, High Springs, Florida 32643. Online registration at ItsYourRace.com. 35th annual Midnight Express 5,000 Meter Road Race. 11:59 PM ET. Country's Barbecue, 3137 Mercury Drive, Columbus, Georgia. Entry form and flyer. Online registration at RunSignUp.com. 34th annual Sickle Cell Foundation of the Big Bend 5K and one-mile fun run. 8:10 AM ET one mile / 8:30 AM ET 5K. Jake Gaither Park, 801 Tanner Drive, Tallahassee, FL 32305. 2014 story. 2011 story. 2010 story. USATF certified course #FL12057EBM. Event web site. Online registration at EventBrite.com. Jill Huewitt, jill@sicklecellfoundation.org or 850-222-2355. 2nd annual We Run This Town 5K. 8:30 AM ET. Blakely First United Methodist Church, 397 College Street, Blakely, Georgia 39823. Entry form and flyer. Margaret Winkler 229-225-7212. 7th annual Quail Trail 5K. 8:00 AM ET. Historic Pebble Hill Plantation, 1251 US Highway 319 South, Thomasville, Georgia. 2014 story. 2010 story. 2009 story. USATF certified course GA09026WC. Event web site. Entry form and flyer. Jennifer Smith, Jennifer.Smith@networkts.com or 229-226-2110. Sinfonia Bravo! Beat 5K. 7:30 AM CT. Village of Baytowne Wharf, 9300 Emerald Coast Parkway, Miramar Beach, Florida 32550. Online registration at active.com. Run With It, Inc, 850-243-1007. Race For Grace 5K and one-mile fun run. 7:30 AM ET 5K / 8:00 AM ET one mile. Northside Elementary School, 985 1st Street NW, Cairo, Georgia. Event page on Facebook. Entry form and flyer. Online registration at active.com. Race For Literacy 5K and one-mile fun run. 8:00 AM CT 5K / 9:00 AM CT one mile. Enterprise State Community College track, 600 Plaza Drive, Enterprise, Alabama 36331. Online registration at active.com. Freeport Bayfest 5K. 8:00 AM CT. Freeport Regional Sports Complex, 1850 Hammock Bay Bend, Freeport, Florida 32439. Event web site. Online registration at active.com. Miracle Hill 5K. 7:30 AM ET. Cascades Park, 1001 South Gadsden Street, Tallahassee, Florida 32301. Entry form and flyer. 5th annual Get-A-Mammy 5K. 8:00 AM ET. Bethany Baptist Church, 5064 Bethany Road, Hahira, Georgia 31632. 2014 story. 2013 story. 2012 story. 2011 story. Entry form and flyer. Online registration at RunSignUp.com. Headland Harvest Run 5K and one-mile fun run.8:00 AM CT 5K / 9:00 AM CT one mile. Gazebo on the downtown square, Grove Street and Main Street, Headland, Alabama 36345. Entry form and flyer. 8th annual Red Cross Robin Lotane Memorial Hurricane Run 5K and one-mile fun run. 8:00 AM ET one mile / 8:30 AM ET 5K. State Office Satellite Complex at SouthWood, 4079 Esplanade Way, Tallahassee, Florida. 2013 story. 2012 story. 2011 story. 2010 story. 2009 story. Online registration at EventBrite.com. Capital Area Chapter of the American Red Cross, 850-878-6080. Spencer's Run Against Bullying 5K and one-mile fun run. 8:00 AM ET 5K / 8:30 AM ET one mile. 5555-2 Roanoke Trail, Tallahassee, Florida 32312. Online registration at RunSignUp.com. Bainbridge-Decatur County Humane Society Race To Rescue 5K and one-mile dog jog. 9:00 AM ET. Earle May Boat Basin Nature Trail, Bainbridge, Georgia. Entry form and flyer. Nicole Touchton, nikkitouchton@hotmail.com or 229-254-3371. 7th annual Riverwalk Run 5K. 5:00 PM CT. Riverwalk Pavilion, 5237 South Willing Street, Milton, Florida 32570. USATF certified course FL09073EBM. Event page on Facebook. Event web site. Online registration at RunSignUp.com. linsey.williamson@ci.milton.fl.us or 850-983-5466. Prooftoberfest 5K. 9:00 AM ET. Proof Brewing Production Facility in Railroad Square, 644 McDonnell Drive,Tallahassee, Florida 32310. Event page on Facebook. Online registration at RunSignUp.com. Buddy Check 10K Trail Run and one-mile fun run. 9:30 AM ET one mile / 10:00 AM 10K. Chehaw Park Mountain Bike Trailhead, 105 Chehaw Park Road, Albany, Georgia 31701. Entry form and flyer. Online registration at active.com. 229-446-4020. Cast Iron 5K. 8:00 AM ET. Citizens National Bank Parking Lot, 100 East Stephens Street, Quitman, Georgia 31643. 2014 story. 2011 story. Online registration at RunSignUp.com. 229-242-0676. 8th annual Sandi McCool Champions of Hope 10K and 5K. 8:00 AM CT. Alabama College of Osteopathic Medicine, 445 Health Sciences Boulevard, Dothan, Alabama 36303. Event web page. SAMC Foundation, 334-673-4150. 3rd annual Jogging For Jugs 5K. 8:00 AM ET. Roy's Restaurant, 100 1st Avenue SW, Steinhatchee, Florida. Event page on Facebook. Patty Zurbrick, 352-356-7100. Run Out Hunger 10K and 5K. 8:00 AM CT. Southwide Baptist Church, 1307 Coy Burgess Loop, DeFuniak Springs, Florida 32435. Event web page. Online registration at active.com. Albany Kiwanis Club Pancake Run 5K and one-mile fun run. Darton State College, 2400 Gillionville Road, Albany, Georgia 31707. Online registration at active.com. Albany Kiwanis Club 229-438-0672. TMH For Life Challenge October 5K and one-mile fun run. 8:30 AM ET one mile / 9:00 AM ET 5K. Tallahassee, Florida. Forrest Revolinski, Forrest.Revolinski@tmh.org or 850-431-2348. Winnersville Football 5K and one-mile fun run. 8:00 AM ET 5K / 9:00 AM ET one mile. Valdosta State University Recreation Center, 1300 Sustella Avenue, Valdosta, Georgia 31698. Entry form and flyer. Online registration at RunSignUp.com. Chryse Thomas, cthomas@gocats.org or 229-671-6025. Montessori Madness 5K. 8:00 AM CT. Solomon Park, 1815 Choctaw Street, Dothan, Alabama. Event web page. 3rd annual Great Race 5K. 8:00 AM ET. The Toasted Mug, 105 East Ellis Street, Perry, Florida 32347. Event page on Facebook. Entry form and flyer. Online registration at RaceIt.com. admin@bigbendtrackclub.org or 850-843-0259. MSA 4 Life 5K Blitz and one-mile fun run. 9:30 AM ET. Wild Side Running, 2341 Lake Park Drive, Albany, Georgia 31707. Online registration at active.com. Wild Side Running 229-395-5778. 3rd annual Jack O'Lantern Jog 5K and fun run. 6:30 PM ET fun run / 7:30 PM 5K. Thomas County Upper Elementary School, 4681 U.S. Highway 84 Bypass, Thomasville, Georgia 31792. 36th annual Boston Mini-Marathon. 8:00 AM ET. Commercial Bank, 124 West Jefferson Street, Boston, Georgia 31626. 2014 story. 2013 story. 2012 story. 2011 story. 2010 story. 2009 story. Entry form and flyer. Brad Johnson, bradjohnson@bankcb.com or 229-498-8500 (day) / 229-226-4679 (evening). Spooktacular 5K Trail Run. 8:00 AM CT. Westgate Park Tennis Center, 810 Recreation Road, Dothan, Alabama 36303. Entry form and flyer. chicktimedothan@gmail.com or 334-718-7890. Deerlake Run for Education 5K and one-mile fun run. 8:00 AM ET 5K / 9:00 AM ET one mile. Deerlake Middle School, 9902 Deer Lake West, Tallahassee, Florida 32312. 2014 story. 2013 story. 2011 story. 2010 story. Event page on Facebook. 3rd annual Ryno 5K and one-mile fun run. 8:00 AM ET. Georgia Southwestern State University soccer fields, 800 Georgia Southwestern State University Drive, Americus, Georgia 31709. Online registration at active.com. Ryan Coleman Foundation, 205-577-9940. BrewTallaty Off-Road Duathlon. 10:00 AM ET. Tom Brown Park, 501 Easterwood Drive, Tallahassee, Florida 32311. Event page on Facebook. 2nd annual Harvest Run 10K, 5K, and one-mile fun run. 8:30 AM ET 10K and 5K. Leesburg United Methodist Church, 117 Starksville Avenue North, Leesburg, Georgia 31763. Event page on Facebook. Race web site.